The ivory is more yellow than expected. I will still use these, just not in the room I originally planned. Imbue your decor with the flirty charm of this curtain panel pair. 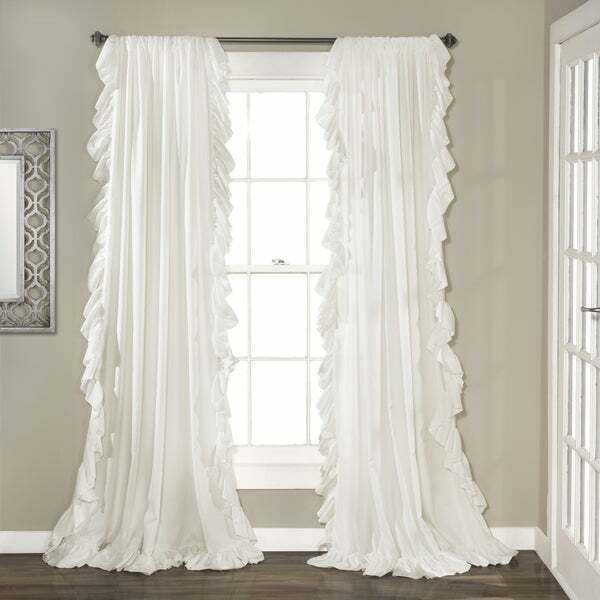 Available in a variety of soft colors to complement your decor, the panels feature ruffled edges for a touch of shabby chic elegance. The soft fabric is machine washable for effortless care. These curtains were exactly what I was wanted for our master bedroom! Gave a very soft touch. I paired my cream Maison Rouge Fabian Curtains with the InStyle Design Stella Bay window curtain rod and they look gorgeous together. 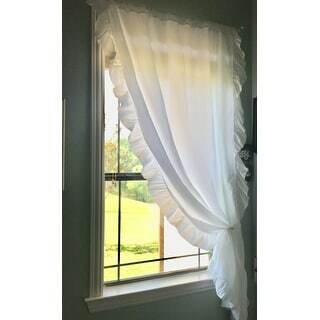 I love the softness of the curtains when I touch them like cashmere to the touch and they lay so beautifully making the room look so elegant. I like the amount of light they let in to room very peaceful in the morning. 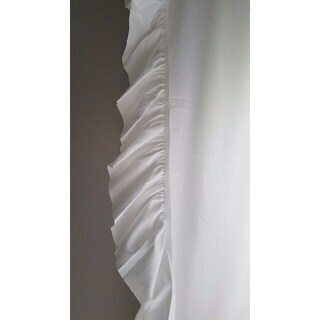 The quality of the material is very good and the sewing is definitely professionally done, because the corners are curves with ruffles and they did a great job. 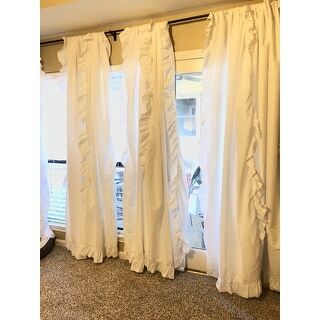 I would recommend these curtains to a friend, I am very pleased with my purchase. I like that these curtains are light and girlie. I don’t think that mine were as long as the 84 inches promised. I measured but could have measured incorrectly. Also, I don’t think the ruffles are as long either, but I like them so I only took one star away. These curtains are beautiful and are exactly as described. They did not wrinkle when packaged. The material is a fairly thick cotton blend. Well worth the cost. 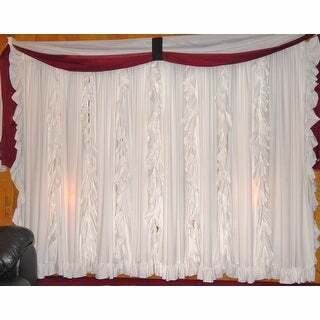 Great material, hangs nicely and ruffles add a soft touch to the edges of the panel. Looks great in sorority house. Absolutely love these curtains! They were wrinkled from packaging, but I steamed them. The set is the perfect touch to my country glam theme. I would definitely purchase again. Looks good, and the fabric feels really high quality! 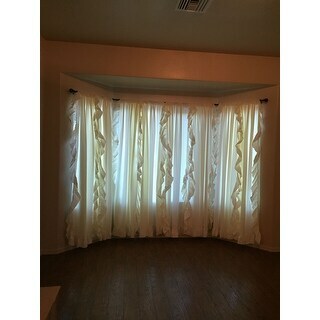 Love these curtain panels... so cute and are perfect!! The curtains came in way sooner than anticipated and was nice and clean. 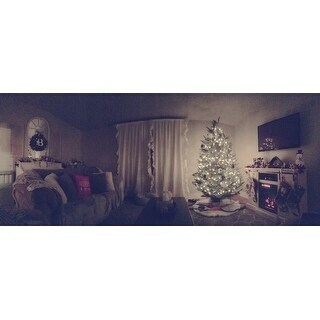 The curtains added the perfect touch to my living room. It helped make the living room feel softer and added more light. 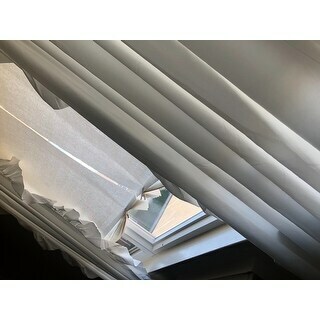 Overstock.com offered the best price for the curtains as well. 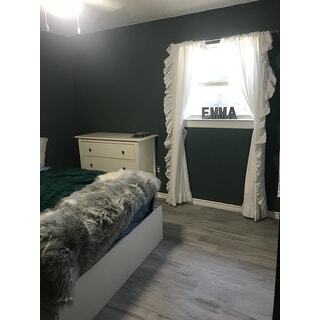 Everywhere else I looked online were selling the same curtains for almost double the price I paid for at Overstock.com. I would definitely recommend the curtains! I ordered the color white and they are more of an ivory or soft white (which is what I wanted -I also learned this from reading numerous reviews). Definitely not a stark, bright white color... so if you're looking for a bright white, you may not like this. 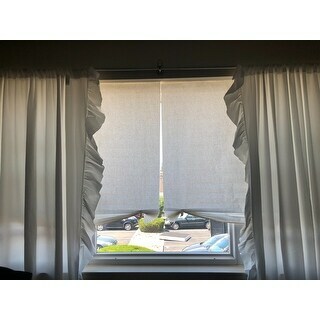 I was so pleased to learn that the other reviews were right about these curtains. 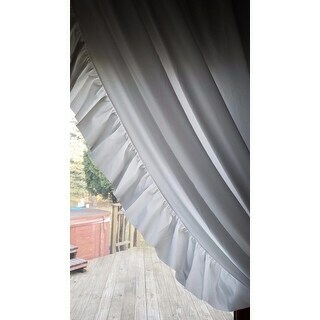 The fabric is unique - it is substantial and drapes beautifully. I hung these in my daughter’s room. They are feminine without being overly frilly. I would definitely recommend. Love the look! It grandkids nursery. ADORABLE. A LITTLE LONG. WOULD BUY AGAIN. Finally was able to get these curtains ironed today and put up. The package arrived in great condition. Since I bought these for our living room they had to be just right. They are perfect. Will get a few pictures when I can and will post them. By the way. These curtains even come with their own hanger/s. 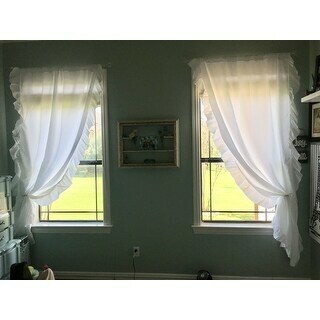 Overall I am very satisfied and will order more curtains again. Thank you, Overstock. I ordered these in the aqua and absolutely love them. They are a little darker than they look in the picture but I still love them. They are nice and thick, lined and really soft fabric. Really brought my office together. I a loving these curtains. I wanted ruffles but not all over the curtain like most. These are perfect for a shower curtain as well to add the cottage look that I have been looking for. I love them. I returned these curtains because I thought they would be an ivory or off-white but they were an ugly yellow. They didn't match my decor, so I sent them back. These grew on me. I didn’t like them at first but I’ve gathered them in the middle and now I love them. I have them on my French doors. Exactly what I wanted in my old fashioned bedroom,... Really pretty and great quality. Quality material. These curtains are well made. 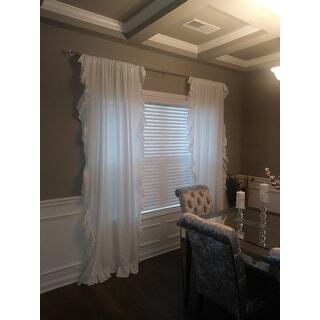 I love the quality and material of these curtains and the style is everything i was looking for!! the price wasn't half bad either! 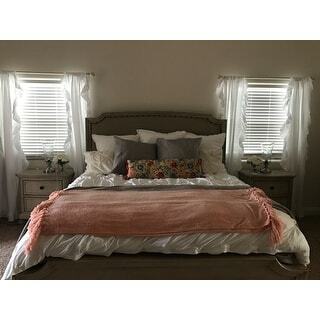 I purchased this for my youngest daughter’s bedroom and they are beautiful! She loves them! Prettiest darn curtains I’ve ever ordered. And a great price! Beautiful and well-made curtains. Looked great in the room except the color was very much a yellow ivory/green rather than an off-white but worked and softens the room. "Is the 54" Width PER PANEL, or the total of both panels combined?" "Could use each panel as a window scarf?" "Is the "blue" a mint?" "The blue in the picture looks more mint green (which I'm looking for). What is the true color? Thanks." "This says curtain panel pair, so I should receive two of these, right? Also, are the width and length given per panel?" Yes you will receive 2 panels. And the length and width are listed under specifications I think. I know there are three lengths, I got the 84’. I really like them and have received many compliments on them. "Any chance the Light Blue or Navy Blue will be available in 95" any time soon?" "Is the color blush still available or only pink?" Blush is currently in stock in an 84 inch length.